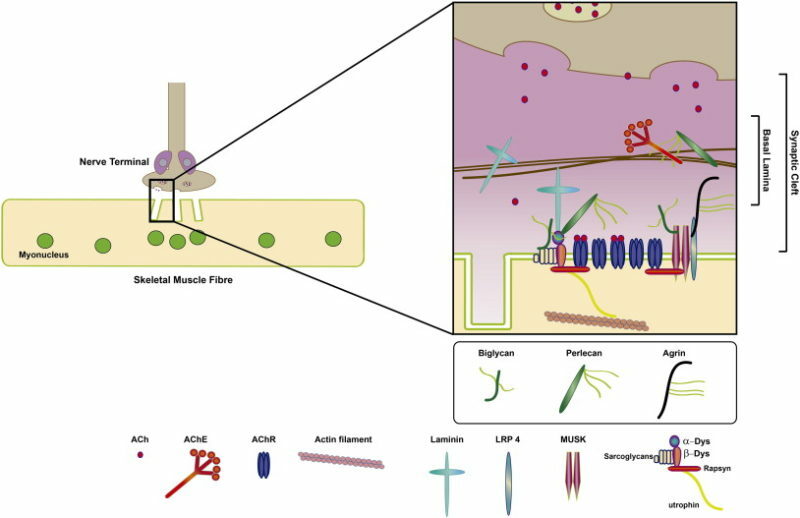 This is part 2 of a 2-part series on the neuromuscular junction in ALS. Check out part 1 here. Alex Parker is delighted to see a potential ALS therapy, his Université de Montréal team and colleagues in Canada discovered in nematodes, reach the clinical-trial stage (Patten et al., 2017). But these worms, after all, are not human, and lack human NMJs. In fact, he recalled, some scientists told the researchers they were crazy to base a trial on these small-animal models. There are certainly differences between species. A recent analysis reported that human NMJs are smaller, simpler, and more fragmented than those of rodents, yet remain stable over longer periods—indeed, they last the entire lifespan, while those of rodents degenerate in just a couple of years. Key NMJ proteins are also differentially expressed, with some at higher levels in people, and some higher in mice (Jones et al., 2017). Overall, though, the NMJs of vertebrates are “pretty similar,” said Steve Burden of the New York University Medical School. An alternative approach, taken by University of Central Florida’s J Hickman and Xiufang Guo, is to build human ALS-specific NMJs in a dish and screen for drugs that stabilize them. They microfabricated chips with one side for iPSC-derived motor neurons and one for satellite cell-derived myotubes, with channels between them for axons to grow through. 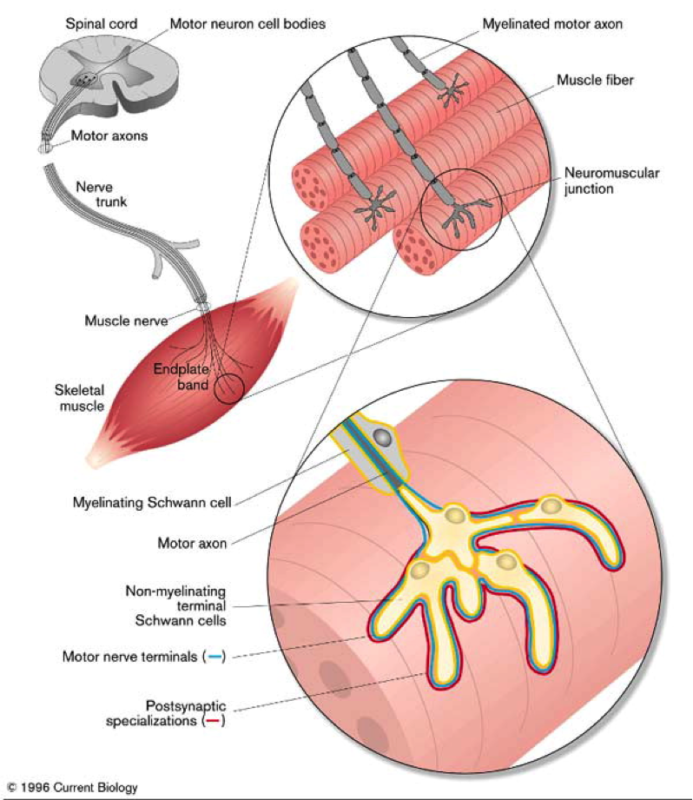 The two cell types connect and form functional NMJs that are able to transmit signals, causing the muscle cells to contract, according to a preliminary analysis presented at ALS/MND 2017 in Boston last December. Now, the team plans to use this system to identify potential therapies for ALS, in collaboration with Hesperos in Orlando, where Hickman is chief scientific officer. However, in vitro models have their downsides, too. They’re typically missing a crucial player: the perisynaptic Schwann cells that encircle the axons. “For a neuromuscular junction to be stable and function, to maintain and repair, they need perisynaptic Schwann cells,” said Virginia Tech’s Gregorio Valdez. 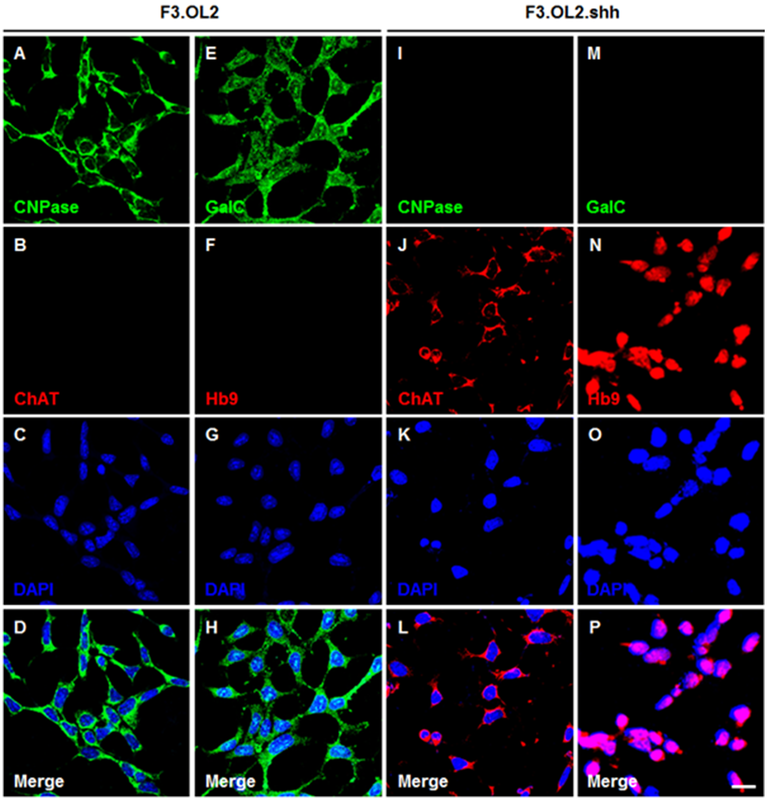 (Other cell types could be added to NMJs-on-a-chip, Hickman and Guo said.) They also lack the blood supply, satellite cells, immune cells, and other features, Université de Montréal’s Richard Robitaille added. As for Université de Montréal’s Pierre Drapeau, he said, “I still believe the whole animal readout is the best.” His collaborator, Justin Ichida at the University of Southern California in Los Angeles, tried pimozide out in their in vitro model and saw no effect. “It might be just be that they’re missing components that are in the animals, that aren’t in the dish,” Drapeau said.